A new recording featuring three major works, all commissioned by and composed for Canada’s premier percussion group NEXUS by award-winning Canadian composers John Hawkins, James Tenney and Bruce Mather. In 1983 John Hawkins was awarded the prestigious Jules Léger Prize for new chamber music.Dance Variations is a six movement work composed with a deceptively “popular” melodic and harmonic vocabulary, yet it remains one of the most rhythmically complex and challenging pieces in the NEXUS repertoire. A recent winner of the Jean A. Chalmers Award, composer, theorist and author James Tenney has received international recognition and acclaim. 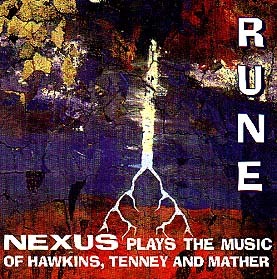 Rune is an extremely colourful work, employing instruments of wood and metal, as well as drums and rattles. Its structure is based on stochastic principles employing “pitch streams” and a “centre of gravity”. One of Québec’s most important composers, Bruce Mather has twice won the Jules Léger Prize for new chamber music. Clos d’Audignac is one of Mather’s many compositions inspired by fine wines, which led to his being initiated into the “Confrérie des Chevaliers du Tastevin” at the Château Clos de Vougeot in 1987.